A bit of Friday fun! Glance over the word image below and write down the first four words that you find. Ok? These are supposed to describe you. I’m not sure how accurate this is as I can’t find the original source online, but it’s fun to do. What are the four words that describe you? Post them below! 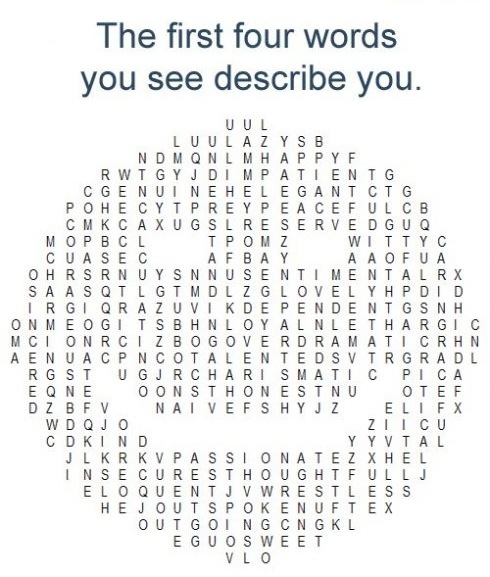 passionate, Sweet, Lovely and Loyal. Prey, bay, cut and car! What a load of rubbish! I’m going to watch out for brussels. I will appreciate if you continue this in future. Lots of people will be benefited from your writing. Cheers! Honest, thoughtfull, spoken, elegant. What does it mean?